Bringing the video gaming community together in Central Australia. ThunderLan is run roughly 5 times a year. Are you looking to spruce up your game machine or even build an entire rig from scratch? Then we can show you how! Who said consoles didn’t belong at LAN?!? 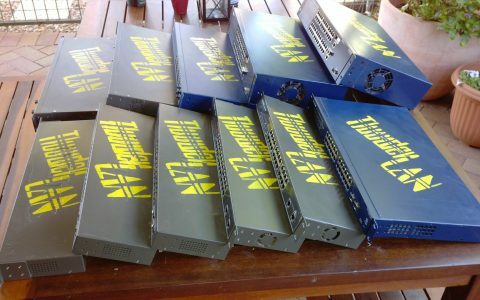 ThunderLAN is a community LAN event. That means a whole bunch of people bring their computers and console together in one place, socializing, learning, and yes, playing games together. The event has been around in its numerous incarnations for over a decade, and has been at the Sadadeen Marian hall for over 6 years. The event is well established and is run by the Alice Springs LAN Group, a not-for-profit organization setup to organize and run ThunderLAN, with the help of volunteers and sponsors. At ThunderLAN you can expect to find a PC gamers, console gamers, music, food, drinks, competitions, prizes, and other activities like the LAN Olympics and PC building lessons. Tables, chairs, internet access, high speed local network, and plenty of power is available; all you need to bring is your device. There is a $15 entry fee for people bringing devices, but people who just want to check it out are welcome for free. Events are ran roughly 5 times a year, happen on Saturdays, and go from 3 pm to midnight. Read More "ThunderLAN this weekend!" Read More "New ThunderLAN YouTube channel"
Read More "ThunderLAN this Saturday!" Read More "Schedule for tomorrows ThunderLAN." At ThunderLAN your able to play any game you want to, we don’t have strict rules on this. That said, we also run organised games on a schedule to allow for people who just want to play what’s on, and to allow us to give out prizes for some games. Like pictures, check out the following posts with images! Final ThunderLAN for 2018 this weekend! Read More "Final ThunderLAN for 2018 this weekend!" Here be the latest batch of pictures from last ThunderLAN. Continue reading"Photos from ThunderLAN 29th September 2018"
Read More "Photos from ThunderLAN 29th September 2018"
Read More "Photos from ThunderLAN 28th April 2018 & 24th February 2018"
Read More "Photos for ThunderLAN 16th-9-17"
ThunderLAN is organized and run by the Alice Springs LAN Group, a not-for-profit organization made up of volunteers. The members of ASLG are passionate gamers, new and old, with extensive technical skill and experience running organizations and events. Continue reading"Final ThunderLAN for 2018 this weekend!" Here be the latest batch of pictures from last ThunderLAN. Continue reading"New ThunderLAN YouTube channel"
Yesterdays event has finished, and now its time for the pictures from yesterdays and the previous ThunderLAN’s. Continue reading"Schedule for tomorrows ThunderLAN." First ThunderLAN of 2018 this weekend! Continue reading"First ThunderLAN of 2018 this weekend!" For all your fire & security needs. Sign up to the ThunderLAN mailing list and make the news flow to you on when the next exciting LAN is on! Sign-up to the ThunderLAN mailing list - don't miss the fun!